For busy families, the slow cooker just might be the best thing since sliced bread. There is nothing more comforting than coming home and having a delicious, hot meal ready to for the whole family to enjoy. Unfortunately, there is little we can do about the chilly weather most of the country is experiencing this winter, but we can help you escape the bitter cold by experiencing the joy of warm comfort food! 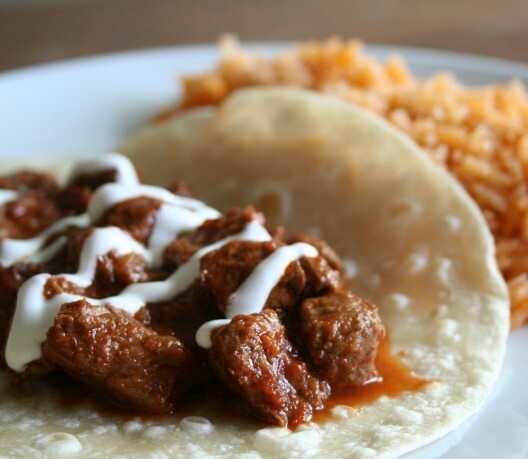 Here are some of our favorite slow cooker recipes developed by talented food bloggers made with TortillaLand® flour and/or corn tortillas. Enjoy! We love this simple, easy slow cooker recipe and we think your whole family will love it too. Jenica from A Slice of Style nails this dish that is perfect for a weeknight dinner on the run or a relaxed weekend. Food blogger Sarah Olson adapted this savory dish from a family recipe of hers. We were flattered to see that she uses TortillaLand® tortillas! "I have no energy to make homemade tortillas, what’s the next best thing? TortillaLand uncooked tortillas," she says. "You brown them, and they puff up a bit, just like homemade, and they only have 5 ingredients in them! Just Scoop this Slow Cooker Steak Burritos filling on them, and dinner is ready!" Click here for her recipe. Food blogger Angela Roberts is never afraid to try something new and different on her blog, Spinach Tiger. Her creations always result in amazing cuisine, and this recipe is no exception. She uses the slow cooker to create these amazing carnitas. "Had I known carnitas was this easy, I would have made this meal years ago," she says. "We only eat one brand of tortillas. TortillaLand® tortillas are raw and have to be pan fried for about a minute. Once you have them, you’ll never go back to the precooked ones. When heating in a cast iron pan, they puff up and get a beautiful char." Click here for the recipe. What isn't to love about savory enchiladas that practically cook themselves? We found this recipe on the food blog, Golden Bonbons and encourage you to try it. "The best parts about this recipe is how easy it is to prep and how healthy it is," she says in her post. Click here for the recipe. Photo @ Eat. Drink. Smile. Yes, this is our 2nd pork carnitas recipe in the post- but it's sooooo good we just had to feature it! This recipe was originally posted on Eat. Drink.Smile and is sure to chase away the winter blahs. It's perfect for watching big games, or just for a fun night in with friends and family. Click here to try it!